We are aware of our role in the communities in the over 60 countries where we operate. We represent a key reference for them. However, we think that since we are a multinational and large Group, we should not just be limited to the concerns of local areas in which Group companies have a presence, but should also enlarge our scope, facing international projects and solving the problem concerning the planet. Our commitment is therefore expressed at both local and global level, with initiatives implemented outside the country where the Group has a presence, thus reaching specific areas where population faces severe concerns (e.g. African countries hit by hunger and/or AIDS), and with projects that are not directly linked to a particular area but produce results for the benefit of all, such as benefits from scientific research. In the field of scientific research a project that makes us particularly proud is the partnership with Revert, an Italian non-profit organization that performs clinical trials aimed at finding a cure for neurodegenerative diseases. In 2013 we signed a three-year partnership. It will allow the international team led by Professor Angelo Vescovi to complete a clinical trial of a cellular therapy for ALS (Amyotrophic Lateral Sclerosis) by the Autumn, which will later also be extended to other neurodegenerative diseases. We are investing in an experimental study that is conducted in accordance with the highest international scientific, clinical and ethical standards and aims at finding new solutions for currently incurable diseases. This partnership allows Revert to expand the scope and impact of the research, offering an honest, tangible hope for future cures for patients and their families, whilst confirming Italy’s leading role amongst countries currently conducting trials in the field of stem cells. When supporting local projects, we promote deserving ideas and initiatives, enhancing their social usefulness, and collaborate with national institutions. We also ensure our financial support to the organizations that prove to be more reliable and to pursue objectives in line with those of the Group. Our companies in France, Germany and the Czech Republic are particularly active with regard to networking. The various initiatives implemented include two best practices in different action areas, i.e. sports and social, that are described in the following paragraphs. 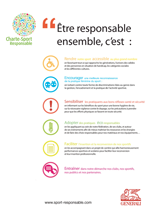 In 2010, Generali France launched the Charte du Sport Responsable (Responsible Sports Charter) with a view to extending the sustainability policy promoted by the Group to sports clubs and federations. raising awareness among sporting associations, athletes, the public and sponsors about the implementation of this initiative. The French equestrian, golf, volleyball and cycling federations have already signed up to the Charter, pledging to promote its principles. Following the publication of the document, a website www.sport-responsable.com was created where, in addition to information on the Charter, you can also find information on member federations and sports clubs, news, initiatives, competitions and events. The common thread of all the activities promoted on this website is sport played in a sustainable and responsible manner. In Germany, the Generali Zukunftsfonds (Generali Future Fund), established in 2008 to address the issue of demographic change, supports projects and initiatives that aim to deal with the consequences of an aging population, paying particular attention to enhancing the skills, time and energy of older people. The objective of the Fund is to drive change and promote networking initiatives in the area of civic engagement, in cooperation with public and private entities. Prior to the launch of the initiative, in 2009, a study known as the Engagement Atlas was carried out to analyse the levels of civic engagement of the German population, and in particular in relation to volunteering activities. Generali Zukunftsfonds used the results of this study to define its mission and scope of action. Bürger unternehmen Zukunft (Citizens for the future): this programme supports all of the national and regional projects that aim to improve the lives of the over 55s by getting them involved in various activities. The objectives of the programme are as follows: to promote transparency on issues of civic engagement among the elderly; to provide practical recommendations with the contribution of science; to provide professional support to volunteering initiatives; to create a network of the various actors involved in volunteering activities; to create a new culture in which the value of civic engagement among the elderly is recognised through the promotion and awarding of prizes and awards. Helfen hilft–Gemeinsam stark (Helping helps – together we are strong), the corporate volunteering programme involving employees of the German companies. In partnership with Institut für Demoskopie Allensbach, the Generali Altersstudie study on living conditions and habits of the German population aged between 65 and 85 years also investigated in its civic engagement and, especially, in its volunteering activities. The study demonstrated not only that 45% of the elderly are active in volunteering and committed to 1.2 billion hours per year, but also that a quarter of such commitment arises for the first time in old age. It highlights that it is possible for one out of five, especially in the highest levels of education and in the ages lower than 75 years, to get even more involved in volunteering. It is therefore important to follow a life of autonomy and to decide when and to what extend they are active. The willingness to take long-term commitments is much lower. In early 2014, the next phase of this research was published – the Generali Hochaltrigenstudie – conducted in collaboration with Institut für Gerontologie of Heidelberg University. In this new study, 400 elderly people aged between 85 and 99 years were interviewed in order to highlight the issues and the potential with regard to the civic engagement of people in this age bracket.